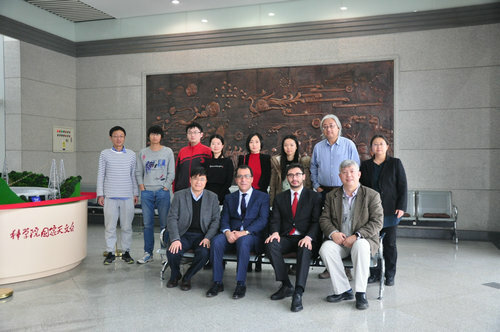 On 20 March, 2018, Mr. Jaime Chomali, Ambassador of the Republic of Chile, and Mr. Cesar Gamboa, Third Secretary of the Embassy, visited National Astronomical Observatories of Chinese Academy of Sciences (NAOC). During the meeting, Professor Suijian Xue, Deputy Director General of NAOC, extended a warm welcome to Mr. Jaime Chomali and introduced the general situation of NAOC and its international cooperation. Professor Zhong Wang , Director of Chinese Academy of Sciences South America Center for Astronomy (CASSACA) briefed the collaborations and joint projects between China and Chile in the astronomy. Mr. Jaime Chomali appreciated the scientific significance and the current progress CASSACA has made. He also expressed interests to further strengthen collaboration with China in the field of astronomy, and explored the possibility of promoting cooperation between the two sides. The participants from both sides expected that the visit will further promote astronomical cooperation including joint projects, student exchange, observations and researches.